I always have an assortment of cards and gift cards on hand... just in case I need a last minute gift or just to say thank you. NESTLÉ Family wants to help you and your family with get ready for the holidays by providing you with some great products to aid in your entertaining, including the newly released cookbook, Southern Plate: Classic Comfort Food That Makes Everyone Feel Like Family, from Christy Jordan, who blogs at Southern Plate and a bundle of free coupons from CARNATION® Evaporated Milk, TOLL HOUSE® Morsels, TOLL HOUSE® Refrigerated Cookie Dough, JUICY JUICE® and STOUFFER’S®. Visit NESTLÉ Family where you can enter to win a Luxury Included® Family Vacation to Beaches Resort or other weekly prizes in the Holiday Celebrations Sweepstakes giveaway. You can also learn more about their products and recipes on the NESTLÉ Family Facebook page. 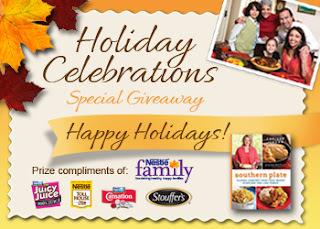 To enter and win a copy of the Southern Plate Cookbook and full-value coupons for selected NESTLÉ Family products, please comment on this post with your favorite way last-minute holiday ideas. I have a few people drop in and well I want to let them have a little something. I usually have some appetizers or finger food in the freezer that I have made and they are able to be heated up in a short time and I usually around the holidays make extra pumpkin bread or eggnog bread and I will have that on hand to give out as gifts if I receive something. Great giveaway! My favorite go to last minute holiday gift idea is making a dry cookie mix recipe in a jar, and including the recipe. It's easy and fun to do! I'd love to make up some if I won this, and even make some fresh :) My fiance and I are on a very tight budget saving for our upcoming wedding so winning this would be so nice! I follow via google friend connect (Nicole-Lynn). if you can't make a cake purchase one from the bakery. I usually keep cookie supplies in stock at my house, especially around the holidays. My favorite to bake is oatmeal-cranberry-white chocolate chip, which surprisingly doesn't take very long. everybody loves them, and they're great for the last minute. Keep cookie and cake ingredients on hand at all times. Great giveaway! I always bake tons of cookies during the holidays so there's always some around. A great last minute cookie recipe is Snickerdoodles- easy and fun to make so you can get the kids in on it! One of my favorite last minute things to do is baking holiday cookies and making candy. I make many batches of Chex Mix for my family, and I make extra to have on hand for instant gifts. Simple to give out in a plastic bag tied with colorful ribbon. At my house, we always get so tired of regular holiday cookies, so I came up with another version that everyone loves, and it's so easy, and I always have the ingredients in my fridge. They are Toll House Chocolate Chip Cheesecake Bars! Just two pack of Tollhouse, cream cheese, egg, sugar and vanilla, and we have a quick yummy dessert for when we have unexpected guests!